Count 1: Incorporating an apostrophe in the construction of a plural noun. Count 2: Possession of grammatically improper packaging with intent to distribute. 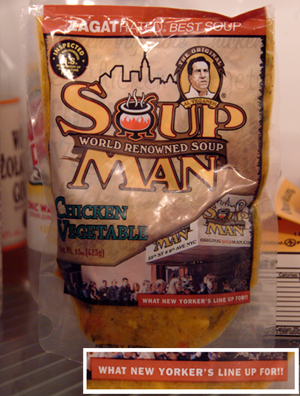 Report: Officer was aware of the deliciousness of Soup Man soups from the 1995 “Soup Nazi” episode of Seinfeld and the most recent edition of Consumer Reports magazine. While on a routine visit to the depressing but convenient D’Agostino supermarket the officer spotted Soup Man soup for sale at an impressively obnoxious $5.99. The officer purchased the soup and returned to his domicile only to discover the grammatical negligence prior to cooking. In the following days, having been alerted to the potential for the suspect’s grammatical indecency, the officer reconnoitered a Soup Man franchise location and discovered the infraction was also printed on all Soup Man store awnings. Fine: Assorted delicious bisques and chowders – with a free side of bread.